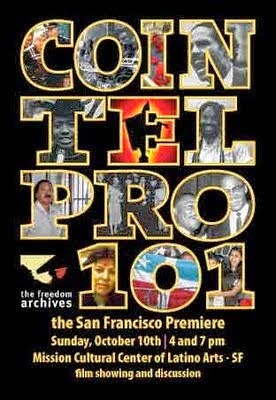 COINTELPRO 101 – Listen to the full length audio documentary here. The Freedom Archives, 522 Valencia Street, San Francisco, CA 94110; Phone: (415) 863-9977; E-mail: info [at] freedomarchives [dot] org. Democracy Now Archive Peltier-related segments. Lecture on COINTELPRO (26 June 2001) – By Ward Churchill, MP3 audio stream provided by TUC Radio in San Francisco (www.tucradio.org) via Radio4All (www.radio4all.net). Lecture on the History of Counterintelligence (28 January 2001) – By Ward Churchill at the National Conference for Organized Resistance, American University, Washington, DC. MP3 audio stream provided by www.wardchurchill.net. Visit Us On YouTube, too!